Foreign property owners (properties outside Canada) - We have a system for you called www.InternationalListings.ca launched spring 2016. You can now also list your property right here for free. We have a syndicated marketing system and admin platform designed especially for you. It allows multiple listings and tools intended for reps, brokers, builders and landlords. You can sign-up on this website or on iListit.ca - the system will know where to send you to admin your listings. Free2List.ca is owned and operated by VRB Internet Solutions Ltd., a Canadian web design and online systems company specializing in innovative methods of Internet marketing since 1999. Free2List was was launched in 2007 and has undergone several updates over time, but our core mission of providing effective free property marketing in Canada has never changed. We always delivered a system which was open to everyone - owners and professionals and did not “take sides” when it comes to the “by-owner” or “agency“ debate. We believe the individual should choose their own course – and we will assist everyone to the best of our ability. We have numerous websites and apps aimed at advertising Canadian real estate. 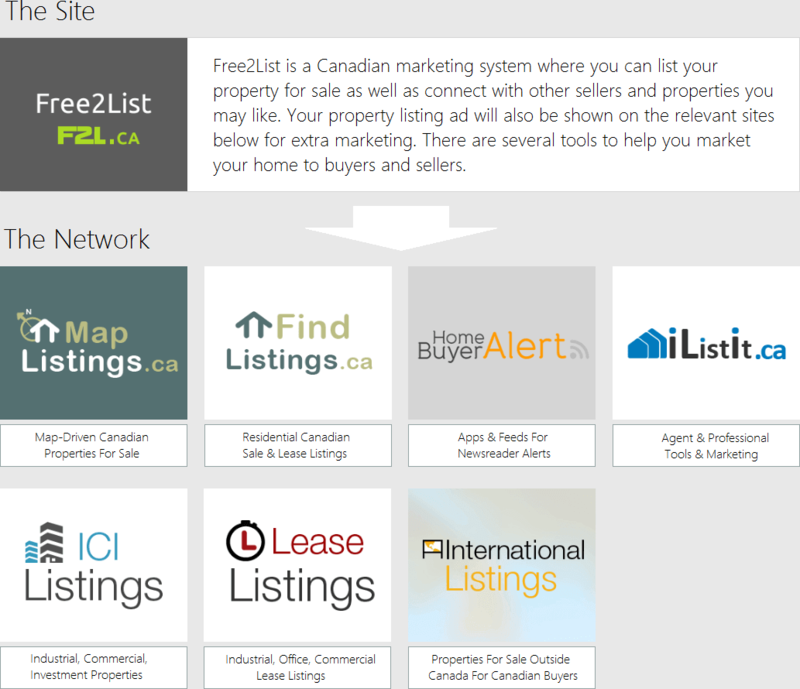 Free2List.ca (this site) takes your listings and "populates" many other sites with them. iListit.ca is the same basic service but specifically for professionals. These two systems work together allowing everyone great free (and paid) services. To display all these listings, we operate many more sites to maximize the potential of finding an interested buyer for you. For example, "findlistings.ca" is our flagship site showing all residential realty in Canada. maplistings.ca speaks for itself and employs GPS-enabled positioning to easily show you close properties. We have systems designed for other specific technology too (like HomeBuyerAlert.ca for XML/RSS users), and iOS / Android apps, thus increasing our marketing reach further. We continually adapt and revise the system to capture as much traffic as we can for you. 2019 VRB Internet Solutions Ltd. All Rights Reserved.